On Sunday October 29, 2017 from 2- 8pm, Deniece. 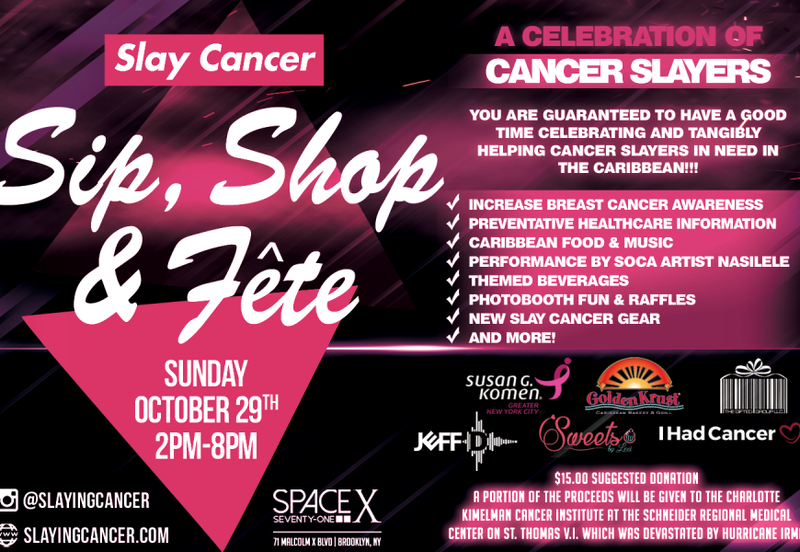 C. Styles (founder of SLAY CANCER) will host a Sip, Shop and Fête (party) event at Space 71 in Brooklyn, NY. Unlike the "typical" sip and shop, this fun and informative soiree will focus primarily on breast cancer and its effects on the young black and latina community but with a Caribbean twist!! Titled 'The Slay Cancer Sip, Shop and Fête' event will attract over 50 attendees that are cancer patients, survivors, supporters or simply fashion/entertainment industry tastemakers that recognize the importance of a healthy MIND( live performances, music and shopping!) , BODY (healthy food and natural juices) and SOUL (live Breast Cancer awareness inspired drawing ) as well as proactive health care and the relevance of early detection. The program will feature live models (wearing 2017 mas band camp carnival costumes AND premiere pieces from the 'Slay Cancer' fall line) and live entertainment from one of the hottest new FEMALE soca artists out of Grenada, Nasale (who has family members affected by breast cancer) alongside the 'Soca Zoe' himself DJ Jeff D spinning the best reggae, soca, zouk, and bacchata as well as hip hop, r&b and pop hits!!! A personalized photo booth and props will be in the building to capture good times and memories. Healthy, Caribbean inspired finger foods and natural juices specifically soursop(Caribbean fruit) infused drinks-for its proven natural cancer killer elements, will be available for patrons to sip on while they shop and fête( party). 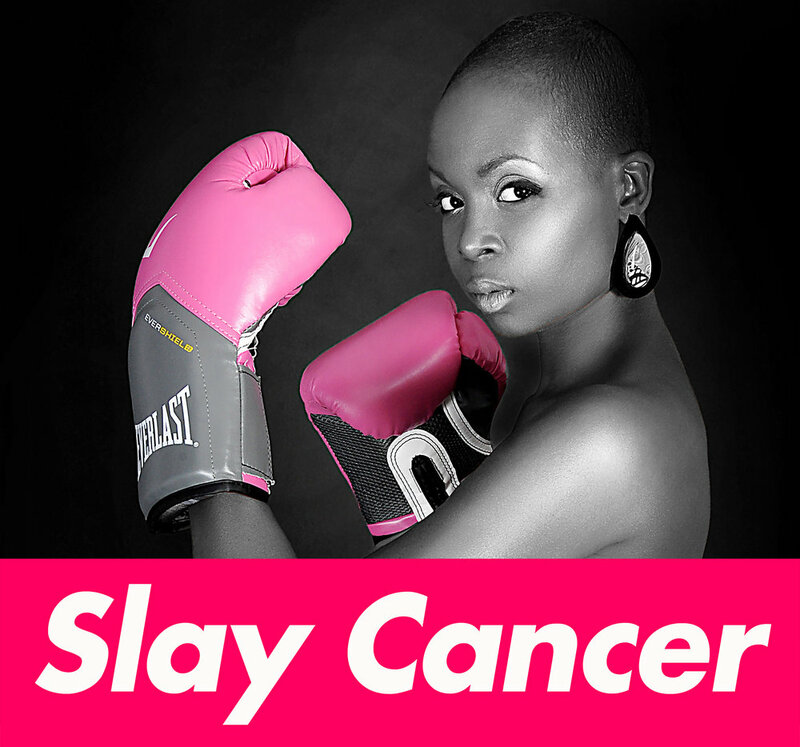 And speaking of shopping, the Slay Cancer fall line will finally be unveiled and available for purchase for Cancer Slayers, Cancer Supporters or in remembrance of our fallen angels. Live visual artist Daphney B will be drawing a breast cancer awareness inspired piece during the event which will later be raffled off. 100% of raffle donations will be given to a non-for-profit breast cancer focused organization. Slay Cancer Swag bags will provide facts and pertinent information for proactive breast and general healthcare and the importance of EARLY DETECTION! !